Multiple patterning (or multi-patterning) is a class of technologies for manufacturing integrated circuits (ICs), developed for photolithography to enhance the feature density. It is expected to be necessary for the upcoming 10 nm and 7 nm node semiconductor processes and beyond. The premise is that a single lithographic exposure may not be enough to provide sufficient resolution. Hence additional exposures would be needed, or else positioning patterns using etched feature sidewalls (using spacers) would be necessary. Different techniques for multiple patterning. Top: Splitting of features into two groups, each patterned by a different mask. Center: Use of a spacer to generate additional separate features in the gaps. Bottom: Use of an opposite polarity feature to cut (small break) or trim (extended removal) pre-existing features. Even with single exposure having sufficient resolution, extra masks have been implemented for better patterning quality such as by Intel for line-cutting at its 45nm node or TSMC at its 28nm node. Even for electron-beam lithography, single exposure appears insufficient at ~10 nm half-pitch, hence requiring double patterning. There are a number of situations which lead to multiple patterning being required. Stochastic defects limit EUV resolution. Stochastic defects are more serious for tighter pitches; at 36 nm pitch defect rate does not drop below ~1e-9. Contact patterns have severe defectivity at larger dimensions. The most obvious case requiring multiple patterning is when the feature pitch is below the resolution limit of the optical projection system. For a system with numerical aperture NA and wavelength λ, any pitch below 0.5 λ/NA would not be resolvable in a single wafer exposure. The resolution limit may also originate from stochastic effects, as in the case of EUV. Consequently, 20 nm linewidth still requires EUV double patterning, due to larger defectivity at larger pitches. Diminishing pitches at line bends. At a 90 degree line bend, diminishing pitches (dotted lines) exist between corresponding locations on the two branches. These pitches cannot be resolved, leading to blurring, rounding of sharp corners. This could have yield impact due to via coverage risk. Two-dimensional pattern rounding. Two-dimensional dense patterns formed from few interfering beams are always severely rounded. Bend distortion by off-axis illumination. The bends in a metal pattern are the features most susceptible to distortion. It is well-established that dense two-dimensional patterns, which are formed from the interference of two or three beams along one direction, as in quadrupole or QUASAR illumination, are subject to significant rounding, particularly at bends and corners. The corner rounding radius is larger than the minimum pitch (~0.7 λ/NA). This also contributes to hot spots for feature sizes of ~0.4 λ/NA or smaller. For this reason, it is advantageous to first define line patterns, then cut segments from such lines accordingly. This of course, requires additional exposures. The cut shapes themselves may also be round, which requires tight placement accuracy. The rounding of line tips naturally leads to a tradeoff between shrinking the line width (i.e., the width of the line tip) and shrinking the gap between opposite facing tips. As the line width shrinks, the tip radius shrinks. When the line tip is already less than the point spread function (k1~0.6-0.7), the line tip naturally pulls back, increasing the gap between opposite facing tips. The point spread function likewise limits the resolvable distance between the centers of the line tips (modeled as circles). This leads in turn to a tradeoff between reducing cell width and reducing cell height. The tradeoff is avoided by adding a cut/trim mask (see discussion below). Hence, for the EUV-targeted 7nm node, with an 18 nm metal linewidth (k1=0.44 for λ=13.5 nm, NA=0.33), the line tip gap of less than 25 nm (k1=0.61) entails EUV single patterning is not sufficient; a second cut exposure is necessary. Different patterns require different illuminations. Different patterns in the same layout (as indicated by different colors) could require different illuminations, and hence, different exposures. While horizontal and vertical lines may be addressed with a common illumination, 45-degree orientations would suffer. Consequently, to include all these cases would require separate exposures. When patterns include feature sizes near the resolution limit, it is common that different arrangements of such features will require specific illuminations for them to be printed. The most basic example is horizontal dense lines vs. vertical lines (half-pitch < 0.35 λ/NA), where the former requires a North-South dipole illumination while the latter requires an East-West dipole illumination. If both types are used (also known as cross-quadrupole C-Quad), the inappropriate dipole degrades the image of the respective line orientation. Larger pitches up to λ/NA can have both horizontal and vertical lines accommodated by quadrupole or QUASAR illumination, but diagonally spaced features and elbow features are degraded. In DRAM, the array and periphery are exposed at different illumination conditions. For example, the array could be exposed with dipole illumination while the periphery could use annular illumination. This situation applies to any set of patterns (half-pitch < 0.5 λ/NA) with different pitches or different feature arrangements, e.g., rectangular arrays vs. staggered arrays. Any of the individual patterns is resolvable, but a single illumination cannot be used simultaneously for all of them. The inclusion of both isolated and dense features is a well-known instance of multi-pitch patterning. Subresolution assist features (SRAFs) have been designed to enable the patterning of isolated features when using illumination tailored for the dense features. However, not all pitch ranges can be covered. In particular, semi-dense features may not be easy to include. Array-specific illuminations. Different array configurations require different and mutually exclusive illuminations. To accommodate all of these would require different exposures with the different illuminations. For the specific case of hole arrays (minimum half-pitch < 0.6 λ/NA), three well-known cases require three entirely different illuminations. A regular array generally requires Quasar illumination, while the same array rotated 45 degrees results in a checkerboard array that requires C-quad illumination. Different from both cases, an array with close to triangular or hexagonal symmetry requires hexapole illumination. OPC hotspot. Insufficient space (red region) for assist features to support 2x minimum metal pitch (MMP) in the presence of 1x MMP is prohibited. Patterns with incompatible illuminations. Illuminations tailored for certain parts of a multi-pitch pattern may degrade other aspects. Here, the blue locations benefit the minimum line pitch, while the red locations benefit the line breaks but not the minimum line pitch. Sometimes a feature pattern inherently contains more than one pitch, and furthermore, these pitches are incompatible to the extent that no illumination can simultaneously image both pitches satisfactorily. 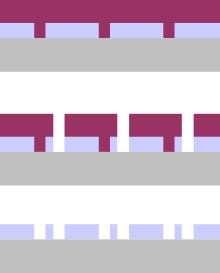 A common example, again from DRAM, is the brick pattern defining the active regions of the array. In addition to the narrow pitch of the active regions, there is also the pitch between the active region separations or breaks, which is double that of the narrow pitch in the same direction. When the narrow pitch is < λ/NA (but still > 0.5 λ/NA), it cannot be imaged simultaneously with the double pitch due to the focus limitations of the latter. Sidelobe from incomplete cancellation of constructive interference in a broken line pattern. A two-beam interference pattern (half-pitch <0.5 λ/NA) forms a set of regularly spaced lines. Breaks in such lines, e.g., brick patterns, are deviations from the interference pattern. Such breaks generally do not dominate the pattern, and are thus small deviations. These deviations are insufficient to completely offset the constructive or destructive interference of the underlying regular line pattern; sidelobes often result. Another mask exposure (usually referred as a cut mask) is therefore necessary to break the line pattern more robustly. Brick pattern image distortion. The difference between cross-line and cross-break image is severe enough that a cut mask is needed. Overlay between line and cut. The cut pattern overlay on the line is important to avoid edge placement error, leaving a portion of the line uncut. Moreover, a dose error can aggravate this. Rounding of line cuts. A shorter line cut is subject to more severe rounding. The earliest implementation of multiple patterning involved line cutting. This first occurred for Intel's 45nm node, for 160 nm gate pitch. The use of a second mask to cut lines defined by a first mask does not help increase feature density directly. Instead it allows definition of features, e.g., brick patterns, which are based on lines spaced at a minimum pitch, in particular, when the lines are near the resolution limit and are generated by the two-beam interference mentioned above. The two-beam interference still dominates the diffraction pattern. When applying the second mask to cut lines, the overlay relative to the first mask needs to be considered; otherwise, edge placement errors (EPE) may result. If the line pitch is already near the resolution limit, the cut pattern itself may have imaging difficulty, from reduced dose or focus window. In this case, more than one cut mask would have to be used, or else the cut has to extend over more than one line. Self-aligned cutting (to be discussed below) may be a preferred option. The earliest form of multiple patterning involved simply dividing a pattern into two or three parts, each of which may be processed conventionally, with the entire pattern combined at the end in the final layer. This is sometimes called pitch splitting, since two features separated by one pitch cannot be imaged, so only skipped features can be imaged at once. It is also named more directly as "LELE" (Litho-Etch-Litho-Etch). This approach has been used for the 20 nm and 14 nm nodes. The additional cost of extra exposures was tolerated since only a few critical layers would need them. A more serious concern was the effect of feature-to-feature positioning errors (overlay). Consequently, the self-aligned sidewall imaging approach (described below) has succeeded this approach. Double patterning by pitch splitting. Double patterning by pitch splitting involves assigning adjacent features to two different masks, indicated by the different colors. It remains the simplest multiple patterning approach practiced today, and adds less cost than EUV. A "brute force" approach for patterning trenches involves a sequence of (at least) two separate exposures and etchings of independent patterns into the same layer. For each exposure, a different photoresist coating is required. When the sequence is completed, the pattern is a composite of the previously etched subpatterns. By interleaving the subpatterns, the pattern density can theoretically be increased indefinitely, the half-pitch being inversely proportional to the number of subpatterns used. For example, a 25 nm half-pitch pattern can be generated from interleaving two 50 nm half-pitch patterns, three 75 nm half-pitch patterns, or four 100 nm half-pitch patterns. The feature size reduction will most likely require the assistance of techniques such as chemical shrinks, thermal reflow, or shrink assist films. This composite pattern can then be transferred down into the final layer. This is best described by considering a process example. A first exposure of photoresist is transferred to an underlying hardmask layer. After the photoresist is removed following the hardmask pattern transfer, a second layer of photoresist is coated onto the sample and this layer undergoes a second exposure, imaging features in between the features patterned in the hardmask layer. The surface pattern is made up of photoresist features edged between mask features, which can be transferred into the final layer underneath. This allows a doubling of feature density. A variation on this approach which eliminates the first hardmask etch is resist freezing, which allows a second resist coating over the first developed resist layer. JSR has demonstrated 32 nm lines and spaces using this method, where the freezing is accomplished by surface hardening of the first resist layer. In recent years, the scope of the term 'pitch splitting' has gradually been expanded to include techniques involving sidewall spacers. In spacer patterning, a spacer is a film layer formed on the sidewall of a pre-patterned feature. A spacer is formed by deposition or reaction of the film on the previous pattern, followed by etching to remove all the film material on the horizontal surfaces, leaving only the material on the sidewalls. By removing the original patterned feature, only the spacer is left. However, since there are two spacers for every line, the line density has now doubled. This is commonly referred to as self-aligned double patterning (SADP). The spacer technique is applicable for defining narrow gates at half the original lithographic pitch, for example. As pitch splitting has become more difficult due to possible differences in feature positions between different exposed parts, sidewall image transfer (SIT) has become more recognized as the necessary approach. The SIT approach typically requires a spacer layer to be formed on an etched feature's sidewall. If this spacer corresponds to a conducting feature, then ultimately it must be cut at no less than two locations to separate the feature into two or more conducting lines as typically expected. On the other hand, if the spacer corresponds to a dielectric feature, cutting would not be necessary. The prediction of how many cuts would be needed for advanced logic patterns has been a large technical challenge. Many approaches for spacer patterning have been published (some listed below), all targeting the improved management (and reduction) of the cuts. As spacer materials are commonly hardmask materials, their post-etch pattern quality tends to be superior compared to photoresist profiles after etch, which are generally plagued by line edge roughness. The main issues with the spacer approach are whether the spacers can stay in place after the material to which they are attached is removed, whether the spacer profile is acceptable, and whether the underlying material is attacked by the etch removing the material attached to the spacer. Pattern transfer is complicated by the situation where removal of the material adjacent to the spacers also removes a little of the underlying material. This results in higher topography on one side of the spacer than the other. Any misalignment of masks or excursion in pre-patterned feature critical dimension (CD) will cause the pitch between features to alternate, a phenomenon known as pitch walking. The positioning of the spacer also depends on the pattern to which the spacer is attached. If the pattern is too wide or too narrow, the spacer position is affected. However, this would not be a concern for critical memory feature fabrication processes which are self-aligned. When SADP is repeated, an additional halving of the pitch is achieved. This is often referred to as self-aligned quadruple patterning (SAQP). With 76 nm being the expected minimum pitch for a single immersion lithography exposure, 19 nm pitch is now accessible with SAQP. Self-aligned contact and via patterning is an established method for patterning multiple contacts or vias from a single lithographic feature. It makes use of the intersection of an enlarged feature resist mask and underlying trenches which are surrounded by a pre-patterned hardmask layer. This technique is used in DRAM cells and is also used for advanced logic to avoid multiple exposures of pitch-splitting contacts and vias. Since 32 nm node, Intel has applied the above-mentioned self-aligned via approach, which allows two vias separated by a small enough pitch (112.5 nm for Intel 32 nm metal) to be patterned with one resist opening instead of two separate ones. If the vias were separated by less than the single exposure pitch resolution limit, the minimum required number of masks would be reduced, as two separate masks for the originally separated via pair can now be replaced by a single mask for the same pair. Spacer-is-dielectric (SID) SADP based on two successive depositions as well as at least two etches. SID SADP has 3x the resolution with allowing the extra mask for line cutting. In self-aligned double patterning (SADP), the number of cut/block masks may be reduced or even eliminated in dense patches when the spacer is used to directly pattern inter-metal dielectric instead of metal features. The reason is the cut/block locations in the core/mandrel features are already patterned in the first mask. There are secondary features which emerge from the gaps between spacers after further patterning. The edge between a secondary feature and the spacer is self-aligned with the neighboring core feature. The use of SID may be applied to 2D arrays, by iteratively adding features equidistant from the previously present features, doubling the density with each iteration. Cuts not requiring tight positioning may be made on this spacer-generated grid. A honeycomb pattern allows tripling of density for patterning of DRAM layers. Samsung recently demonstrated DRAM patterning using a honeycomb structure (HCS) suitable for 20 nm and beyond. Each iteration of spacer patterning triples the density, effectively reducing 2D pitch by a factor of sqrt(3). This is particularly useful for DRAM since the capacitor layer can be fit to a honeycomb structure, making its patterning simpler. SADP vs. SAQP. Compared to SADP, SAQP adds another spacer, enabling further self-aligned processing that allows further pitch reduction. SADP may be applied twice in a row to achieve an effective pitch quartering. This is also known as self-aligned quadruple patterning (SAQP). With SAQP, the primary feature critical dimension (CD), as well as the spacing between such features, are each defined by either the first or second spacer. DSA recombines split vias. Two vias which normally would need separate exposures (red and blue) can be patterned together with DSA assistance using a single guiding pattern exposure (black border). The number of masks used for sidewall spacer patterning may be reduced with the use of directed self-assembly (DSA) due to the provision of gridded cuts all at once within a printed area, which can then be selected with a final exposure. Alternatively, the cut pattern itself may be generated as a DSA step. Likewise, a split via layout may be recombined in pairs. Much progress had been reported on the use of PMMA-PS block copolymers to define sub-20 nm patterns by means of self-assembly, guided by surface topography (graphoepitaxy) and/or surface chemical patterning (chemoepitaxy). The key benefit is the relatively simple processing, compared to multiple exposures or multiple depositions and etching. The main drawback of this technique is the relatively limited range of feature sizes and duty cycles for a given process formulation. Typical applications have been regular lines and spaces as well as arrays of closely packed holes or cylinders. However, random, aperiodic patterns may also be generated using carefully defined guiding patterns. The line edge roughness in block copolymer patterns is strongly dependent on the interface tension between the two phases, which in turn, depends on the Flory "chi" (χ) parameter. A higher value of χ is preferred for reduced roughness; the interfacial width between domains is equal to 2a(6χ)−1/2, where a is the statistical polymer chain length. Moreover, χN > 10.5 is required for sufficient phase segregation, where N is the degree of polymerization (number of monomer repeats in the chain). On the other hand, the half-pitch is equal to 2(3/π2)1/3aN2/3χ1/6. The fluctuations of the pattern widths are actually only weakly (square root) dependent on the logarithm of the half-pitch, so they become more significant relative to smaller half-pitches. DSA has not yet been implemented in manufacturing, due to defect concerns, where a feature does not appear as expected by the guided self-assembly. There have been numerous concerns that multiple patterning diminishes or even reverses the node-to-node cost reduction expected with Moore's Law. EUV is more expensive than three 193i exposures (i.e., LELELE), considering the throughput. Moreover, EUV is more liable to print smaller mask defects not resolvable by 193i. Some aspects of other considered multi-patterning techniques are discussed below. SATP offers less overlay sensitivity. SATP achieves the same pattern as SID SADP but with less overlay sensitivity for the cut/trim mask. Self-aligned triple patterning has been considered as a promising successor to SADP, due to its introduction of a second spacer offering additional 2D patterning flexibility and higher density. A total of two masks (mandrel and trim) is sufficient for this approach. The only added cost relative to SADP is that of depositing and etching the second spacer. The main disadvantage of SATP succeeding SADP is that it would only be usable for one node. For this reason, self-aligned quadruple patterning (SAQP) is more often considered. On the other hand, the conventional SID SADP flow may be extended quite naturally to triple patterning, with the second mask dividing the gap into two features. Tilted ion implantation. Ion damage regions act as sidewall-aligned regions to be etched. A fundamental aspect of this approach is the correlation between damage width and damage pitch; both widen at the same time for fixed ion mask height and ion beam angle. Tilted ion implantation was proposed in 2016 by the University of Berkeley as an alternative method of achieving the same result as spacer patterning. Instead of core or mandrel patterns supporting deposited spacers, an ion masking layer pattern shields an underlying layer from being damaged by ion implantation, which leads to being etched away in a subsequent process. The process requires the use of angled ion beams which penetrate to just the right depth, so as not to damage already processed layers underneath. Also, the ion masking layer must behave ideally, i.e., blocking all ions from passing through, while also not reflecting off the sidewall. The latter phenomenon would be detrimental and defeat the purpose of the ion masking approach. Trenches as small as 9 nm have been achieved with this approach, using 15 keV Ar+ ion implantation at 15-degree angles into a 10 nm thermal SiO2 masking layer. A fundamental aspect of this approach is the correlation between damage width and damage pitch; both widen at the same time for fixed ion mask height and ion beam angle. The method of complementary exposures is another way of reducing mask exposures for multiple patterning. Instead of multiple mask exposures for individual vias, cuts or blocks, two exposures of opposing or complementary polarity are used, so that one exposure removes interior portions of the previous exposure pattern. The overlapped regions of two polygons of opposite polarity do not print, while the non-overlapped regions define locations that print according to the polarity. Neither exposure patterns the target features directly. This approach was also implemented by IMEC as two "keep" masks for the M0A layer in their 7nm SRAM cell. SADP with self-aligned blocking/cutting. Self-aligned blocking or cutting allows lines to be divided into two colors, due to the use of two different materials of different etch selectivity. Only lines of one color may be cut by a given mask exposure. Self-aligned blocking or cutting is currently being targeted for use with SAQP for sub-30 nm pitches. The lines to be cut are divided into two materials, which can be etched selectively. One cut mask only cuts every other line made of one material, while the other cut mask cuts the remaining lines made of the other material. EUV layout splitting due to different illuminations. This layout consists of vertical and horizontal lines requiring two different illuminations optimized for each, since the horizontal layout includes wider lines and spaces. Consequently, the layout needs to be split, even for EUV lithography. Furthermore, additional cut exposures are preferred for the gaps between line tips (circled). Although EUV has been projected to be the next-generation lithography of choice, it could still require more than one lithographic exposure, due to the foreseen need to first print a series of lines and then cut them; a single EUV exposure pattern has difficulty with line end-to-end spacing control. The existing 0.33 NA EUV tools are challenged below 16 nm half-pitch resolution. Tip-to-tip gaps are problematic for 16 nm dimensions. Consequently, EUV 2D patterning is limited to >32 nm pitch. Recent studies of optimizing the EUV mask features and the illumination shape simultaneously have indicated that different patterns in the same metal layer could require different illuminations. On the other hand, a single exposure only offers a single illumination. For example, in a cross-pitch source-mask optimization for 7nm node, for 40-48 nm pitch and 32 nm pitch, the quality as determined by the normalized image log slope was insufficient (NILS<2), while only 36 nm pitch was barely satisfactory for bidirectional single exposure. The underlying situation is that EUV patterns may be split according to different illuminations for different pitches, or different pattern types (e.g., staggered arrays vs. regular arrays). This could apply to line-cutting patterns as well as contact/via layers. It is also likely more than one cut would be needed, even for EUV. At the 2016 EUVL Workshop, ASML reported that the 0.33 NA NXE EUV tools would not be capable of standard single exposure patterning for the 11-13 nm half-pitch expected at the 5 nm node. A higher NA of 0.55 would allow single exposure EUV patterning of fields which are half the 26 mm x 33 mm standard field size. However, some products, such as NVIDIA's Pascal Tesla P100, will be bisected by the half-field size, and therefore require stitching of two separate exposures. In any case, two half-field scans consume twice as much acceleration/deceleration overhead as a single full-field scan. Non-ideal multipatterning: Here a layout is divided into three parts which are each difficult to image. Each part contains features of different sizes and different spacings, as well as different orientations, inheriting the problems of the original layout. Memory patterns are already patterned by quadruple patterning for NAND and crossed quadruple/double patterning for DRAM. These patterning techniques are self-aligned and do not require custom cutting or trim masks. For 2x-nm DRAM and flash, double patterning techniques should be sufficient. Current EUV throughput is still more than 3x slower than 193 nm immersion lithography, thus allowing the latter to be extended by multiple patterning. Furthermore, the lack of an EUV pellicle is also prohibitive. As of 2016, Intel was using SADP for its 10 nm node; however, as of 2017, the 36 nm minimum metal pitch is now being achieved by SAQP. Intel is using triple patterning for some critical layers at its 14 nm node, which is the LELELE approach. Triple patterning is already demonstrated in 10 nm tapeout, and is already an integral part of Samsung's 10 nm process. TSMC is deploying 7 nm in 2017 with multiple patterning; specifically, pitch-splitting, down to 40 nm pitch. Beyond the 5 nm node, multiple patterning, even with EUV assistance, would be economically challenging, since the departure from EUV single exposure would drive up the cost even higher. However, at least down to 12 nm half-pitch, LELE followed by SADP (SID) appears to be a promising approach, using only two masks, and also using the most mature double patterning techniques, LELE and SADP. Color-optimized multi-patterning. Ideally, the three differently colored sets of features are spread as evenly as possible, and follow a consistent pitch. Ref. : A. Raley et al., Proc. SPIE 9782, 97820F (2016). Compared to 193i SADP, EUV SADP cost is dominated by the EUV tool exposure, while the 193i SAQP cost difference is from the added depositions and etches. The processing cost and yield loss at a lithographic tool is expected to be highest in the whole integrated process flow due to the need to move the wafer to specific locations at high speed. EUV further suffers from the shot noise limit, which forces the dose to increase going for successive nodes. On the other hand, depositions and etches process entire wafers at once, without the need for wafer stage motion in the process chamber. In fact, multiple layers may be added under the resist layer for anti-reflection or etch hard-mask purposes, just for conventional single exposure. The mask cost strongly benefits from the use of multiple patterning. The EUV single exposure mask has smaller features which take much longer to write than the immersion mask. Even though mask features are 4x larger than wafer features, the number of shots is exponentially increased for much smaller features. Furthermore, the sub-100 nm features on the mask are also much harder to pattern, with absorber heights ≈70 nm. Multiple patterning with immersion scanners can be expected to have higher wafer productivity than EUV, even with as many as 4 passes per layer, due to faster wafer exposure throughput (WPH), a larger number of tools being available, and higher uptime. Overlay error impact on line cut. An overlay error on a cut hole exposure could distort the line ends (top) or infringe on an adjacent line (bottom). Multiple patterning entails the use of many processing steps to form a patterned layer, where conventionally only one lithographic exposure, one deposition sequence and one etch sequence would be sufficient. Consequently, there are more sources of variations and possible yield loss in multiple patterning. Where more than one exposure is involved, e.g., LELE or cut exposures for SAQP, the alignment between the exposures must be sufficiently tight. Current overlay capabilities are ≈0.6 nm for exposures of equal density (e.g., LELE) and ≈2.0 nm for dense lines vs. cuts/vias (e.g., SADP or SAQP) on dedicated or matched tools. In addition, each exposure must still meet specified width targets. Where spacers are involved, the width of the spacer is dependent on the initial deposition as well as the subsequent etching duration. Where more than one spacer is involved, each spacer may introduce its own width variation. Cut location overlay error can also distort line ends or infringe on an adjacent line. LELE + SADP + cut. LELE + SADP + cut has been proposed for 7nm fins. Gaps between spacers after etchback may also define additional features. LELE + cut patterning. A cut mask gives added flexibility on top of LELE patterning. Multiple patterning is evolving toward a combination of multiple exposures, spacer patterning, and/or EUV. Especially with tip-to-tip scaling being difficult in a single exposure on current EUV tools, a line-cutting approach may be necessary. IMEC reported that double patterning is becoming a requirement for EUV. Grid cut location selection.By first defining cut locations on a grid, the effect of overlay error on cut shape is eliminated. Top: Grid defining cut locations. The points of intersection of the red lines with the underlying metal lines (blue) define the allowed locations. Bottom: Selection of cut locations. SAQP with selective SADP blocking. SAQP combined with SADP for selective blocking is the expected approach for 10 nm half-pitch patterning without EUV. For line patterning, SADP/SAQP could have the advantage over the EUV exposure, due to cost and maturity of the former approach and stochastic missing or bridging feature issues of the latter. For grid location patterning, a single DUV exposure following grid formation also has the cost and maturity advantages (e.g., immersion lithography may not even be necessary for the spacer patterning in some cases) and no stochastic concerns associated with EUV. Grid location selection has an advantage over direct point cutting because the latter is sensitive to overlay and stochastic edge placement errors, which may distort the line ends. The evolution of multiple patterning is being considered in parallel with the emergence of EUV lithography. While EUV lithography satisfies 10-20 nm resolution by basic optical considerations, the occurrence of stochastic defects as well as other infrastructure gaps and throughput considerations prevent its adoption currently. Consequently, 7nm tapeouts have largely proceeded without EUV. In other words, the multiple patterning is not prohibitive, but more like a nuisance and growing expense. 5nm may be expected in 2020, with the evolution of multiple patterning and status of EUV considered at that time. Self-aligned quadruple patterning is already the established process to be used for patterning fins for 7 nm and 5 nm FinFETs. With SAQP, each patterning step gives a critical dimension uniformity (CDU) value in the sub-nanometer range (3 sigma). Among the four logic/foundry manufacturers, only Intel is applying SAQP to the metal layers, as of 2017. Like NAND Flash, DRAM has also made regular use of multiple patterning. Even though the active areas form a two-dimensional array, one cut mask is sufficient for 20 nm. Furthermore, the cut mask may be simultaneously used for patterning the periphery, and thus would not count as an extra mask. When the active area long pitch is ~3.5 x the short pitch, the breaks in the active area form a hexagonal array, which is amenable to the triangular lattice spacer patterning mentioned above. Samsung has already started manufacturing the 18 nm DRAM. Planar NAND flash had several layers which use SADP below 80 nm pitch and SAQP below 40 nm pitch. 3D NAND flash used SADP for some layers. While it does not scale so aggressively laterally, the use of string stacking in 3D NAND would imply the use of multiple patterning (litho-etch style) to pattern the vertical channels. Typically, for NAND, SADP patterns a set of lines from a core mask, followed by using a trim mask to remove the loop ends, and connecting pads with a third mask. ^ Chao, Weilun; Kim, Jihoon; Anderson, Erik H.; Fischer, Peter; Rekawa, Senajith; Attwood, David T. (2009-01-09). "Double patterning HSQ processes of zone plates for 10 nm diffraction limited performance". ^ Duan, Huigao; Winston, Donald; Yang, Joel K. W.; Cord, Bryan M.; Manfrinato, Vitor R.; Berggren, Karl K. (November 2010). "Sub-10-nm half-pitch electron-beam lithography by using poly(methyl methacrylate) as a negative resist" (PDF). Journal of Vacuum Science & Technology B, Nanotechnology and Microelectronics: Materials, Processing, Measurement, and Phenomena. 28 (6): C6C58–C6C62. doi:10.1116/1.3501353. Archived from the original (PDF) on 2012-01-19. ^ D. De Simone, A. Singh, G. Vandenberghe, Proc. SPIE 10957, 109570Q (2019). ^ M. Vala and J. Homola, Optics Express Vol. 22, 18778 (2014). ^ a b c van Setten, Eelco; Wittebrood, Friso; et al. (September 4, 2015). "Patterning options for N7 logic: prospects and challenges for EUV". Proc. SPIE 9661, 31st European Mask and Lithography Conference, 96610G. 31st European Mask and Lithography Conference. 9661: 96610G. Bibcode:2015SPIE.9661E..0GV. doi:10.1117/12.2196426. ^ a b R-H. Kim et al., Proc. SPIE vol. 9776, 97761R (2016). ^ R. L. Jones and J. D. Byers, Proc. SPIE 5040, 1035 (2003). ^ S. Kobayashi et al., Proc. SPIE 6521, 65210B (2007). ^ a b c d R. Kotb et al., Proc. SPIE 10583, 1058321 (2018). ^ a b c Y. Borodovsky, "EUV Lithography at Insertion and Beyond," 2012 International Workshop on EUV Lithography. ^ C. A. Mack, Proc. SPIE 4226, 83 (2000). ^ M. Burkhardt et al., Proc. SPIE 6520, 65200K (2007). ^ E. Hendrickx et al., Proc. SPIE 6924, 69240L (2008). ^ W. N. Partlo et al., Prof. SPIE 1927, 137 (1993). ^ T. Winkler et al., Proc. SPIE 5754, 1169 (2005). ^ Y. Chen et al., J. Vac. Sci. & Tech. B 35, 06G601 (2017). ^ K. Tsujita et al., Proc. SPIE 6520, 652036 (2007). ^ a b K. Tian et al., Proc. SPIE 7274, 72740C (2009). ^ F. M. Schellenberg et al., DAC 2001,Adoption of OPC and the Impact on Design and Layout. ^ V. Wiaux et al., Proc. SPIE 5040, 270 (2003). ^ B. Bilski et al., Proc. SPIE 10466, 1046605 (2017). ^ a b N. Singh and M. Mukherjee-Roy, Proc. SPIE vol. 4691, 1054 (2002). ^ J. Garofalo et al., J. Vac. Sci. & Tech. B 11, 2651 (1993). ^ "Scaling-driven nanoelectronics - Resists". Archived from the original on 2010-03-23. ^ LaPedus, Mark (March 13, 2008). "JSR demos 'freezing material' for 22-nm production". Archived from the original on 2014-07-15. ^ X. Hua et al., J. Vac. Sci. Tech. B, vol. 24, pp. 1850-1858 (2006). ^ Y-K Choi et al., J. Phys. Chem. B, vol. 107, pp. 3340-3343 (2003). ^ Chao, Robin; Kohli, Kriti K.; Zhang, Yunlin; Madan, Anita; Muthinti, Gangadhara Raja; Hong, Augustin J.; Conklin, David; Holt, Judson; Bailey, Todd C. (2014-01-01). "Multitechnique metrology methods for evaluating pitch walking in 14 nm and beyond FinFETs". Journal of Micro/Nanolithography, MEMS, and MOEMS. 13 (4): 041411. Bibcode:2014JMM&M..13d1411C. doi:10.1117/1.JMM.13.4.041411. ISSN 1932-5150. ^ I. Bouchoms et al., Proc. SPIE 7274, 72741K (2009). ^ US Patent 6165880, assigned to TSMC. ^ Y. Loquet et al., Microelec. Eng. 107, 138 (2013). ^ US Patent 8813012, assigned to Synopsys. ^ a b R. Brain et al., IITC 2009. ^ P. Packan et al., IEDM 2009. ^ a b Ref. : US Patent 8312394, assigned to Synopsys. ^ K. Oyama et al., Proc. SPIE 9051, 90510V (2014). ^ B. Mebarki et al., U. S. Patent 8,084,310, assigned to Applied Materials. ^ a b M. C. Smayling et al., Proc. SPIE 8683, 868305 (2013). ^ J. M. Park et al., IEDM 2015, 676 (2015). ^ Z. Xiao et al., Proc. SPIE 8880, 888017-3 (2013). ^ J. Bekaert et al., Proc. SPIE 9658, 965804 (2015). ^ S. H. Park et al., Soft Matter, 6, 120-125 (2010). ^ C. G. Hardy and C. Tang, J. Polymer Sci. Pt. B: Polymer Phys., vol. 51, pp. 2-15 (2013). ^ L-W. Chang et al.IEDM 2010 Technical Digest, 752-755 (2010). ^ A. N. Semenov, Macromolecules 26, 6617 (1993). ^ A. Gharbi et al., Proc. SPIE 9777, 97770T (2016). ^ D. Civay et al., J. Micro/Nanolith. MEMS MOEMS 14, 023501 (2015). ^ K. Seki et al., Proc. SPIE 9658, 96580G (2015). ^ US Patent 7842601, assigned to Samsung. ^ Y. Chen et al., Proc. SPIE 7973, 79731P (2011). ^ M. Mirsaeedi et al., IEEE Trans. VLSI Syst. 22, 1170 (2014). ^ US Patent 7846849, assigned to Applied Materials. ^ S. W. Kim et al., JVST B 34, 040608 (2016). ^ a b F. T. Chen et al., Proc. SPIE 8326, 83262L (2012). ^ S. Sakhare et al., Proc. SPIE 9427, 94270O (2015). ^ N. Mohanty et al., Proc. SPIE 10147, 1014704 (2017). ^ a b T-B. Chiou et al., Proc. SPIE 9781, 978107 (2016). ^ T. H-Bao et al., Proc. SPIE 9781, 978102 (2016). ^ a b Y. Chen et al., J. Vac. Sci. Tech. B35, 06G601 (2017). ^ M. Crouse et al., Proc. SPIE 10148, 101480H (2017). ^ W. Gillijns et al., Proc. SPIE 10143, 1014314 (2017). ^ T. Last et al., Proc. SPIE 10143, 1014311 (2017). ^ S. Hsu et al., Proc. SPIE 9422, 94221I (2015). ^ Merritt, Rick (October 7, 2015). "5nm Test Lights Litho Path Hybrid 193i, EUV seen as best approach". EETimes. ^ Microlithography: Science and Technology, 2nd ed., B. W. Smith and K. Suzuki (eds. ), CRC Press, 2007, p. 94. ^ Handbook of Semiconductor Manufacturing Technology, Y. Nishi and R. Doering (eds. ), CRC Press, 2000, p. 475. ^ U.S. Patent 9318369, assigned to Samsung. ^ S. Y. Wu et al., IEDM 2016, paper 2.7. ^ F. T. Chen et al., Proc. SPIE 8683, 868311 (2013). ^ F. T. Chen et al., Proc. SPIE vol. 8326, 82362L (2012). ^ a b H. Rhee et al., 2018 Symp. VLSI Tech., 217. ^ R. R. Haque et al., Proc. SPIE 9776, 97760F (2016). ^ A. Malik et al., Proc. SPIE 9048, 90481R (2014). ^ B. Vincent et al., Proc. SPIE 10583, 105830W (2018). ^ P. Bisschop and E. Hendrickx, Proc. SPIE 10583, 105831K (2018). ^ P. De Bisschop and E. Hendrickx, Proc. SPIE 10583, 105831K (2018). ^ Y-S. Kang et al., J. Micro/Nanolith. MEMS MOEMS vol. 15(2), 021403 (2016). ^ H. Dai et al., Proc. SPIE 7275, 72751E (2009).